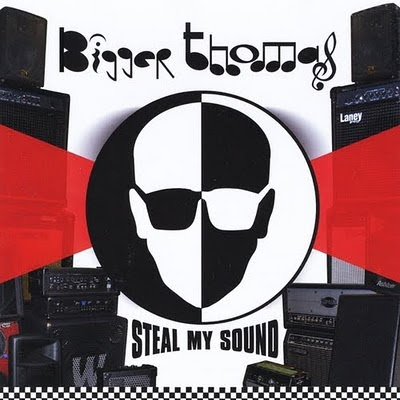 When I first listened to the new Bigger Thomas CD Steal My Sound, my immediate reaction--and I'm carbon dating myself here--was how welcome it was to hear a band keeping the late'80s NYC ska sound alive! (What is the definition of this style of ska? Short answer: put on a copy of Moon Records' NYC Ska Live LP or cassette on the ster-ee-erio and listen! Awkward longer answer: it's heavily 2 Tone-influenced, aggressive modern ska, with strong new wave tendencies and some incursions into vintage ska sounds--and with the exception of The NY Citizens, free of ska-punk). From the start, it's been clear that Bigger Thomas are fanatic devotees of The (English) Beat. You can find all sorts of melodic and rhythmic Wakeling/Cox/Steele DNA strands in Bigger Thomas' music, from their first fan favorite, "Ska in My Pocket" off their wonderful (Wha'ppen-inspired) debut "Red" album, to several tunes on Steal My Sound (most notably, "Kings of the Klub" and "Radics and Roger A Chat"). However, anyone who has followed the band is well aware that Bigger Thomas are much more than Beat imitators. Apart from the light-hearted lyrical boasting and toasting on a few tracks, Steal My Sound is a serious album filled with tales of crushed hopes and diminished expectations. It mirrors the ugly reality of adult life, when you realize that things aren't going to turn out as you imagined they would when you were younger. But amidst the reconfigured world of middle-age, the band has found a gritty determination to follow their path and find satisfaction and happiness on their own terms. And they make some incredible music in the process. The fantastically upbeat "I Can't Remember My Name," one of the best cuts on the album, is ostensibly about stumbling around on a summer day so hot that your brain can't function properly. But it's also a metaphor--we're fallible beings making all kinds of missteps as we try to move forward in the blazing heat of everyday life. Yet, the band also is keenly aware that life is a great adventure to be enjoyed: "I never get lost/but I try to every day!" "Kings of the Klub" (a great versioning of their own "King for a Day" off We Wear the Mask) is a manic DJ clash between Roger Apollon, Jr. and Roy Radics (from The Rudie Crew) for toasting and boasting supremacy that reminds one of "Pato and Roger a Go Talk," with a little Untouchables thrown in the mix ("Make room, make room when they play the rub-a-dub/We rule the dance, we are kings of the club"). It's fantastic. However, if you want to screw with their music, Roger and Roy turn deadly serious on the spare (love the haunting melodica line in there played by King Django, who did a stellar job recording and mixing the album at his Version City Studio) and menacing "Steal My Sound" ("When we come to town/You know we don't mess around/Like a king who holds the crown/Don't steal my sound"). The band's don't-give-a-damn underdog and outsider status is reflected in songs like "Matinee Idol," where Roger sings about pursuing a girl who's "running with the 'A' crowd/My 'C' plus is not allowed/But I've got the nerve/and I hope you're grading on the curve." He pictures himself as an overseas movie star (as opposed to the standard Hollywood leading man) in the "foreign films you do adore/Well, I could be a matinee idol/with the yellow subtitles/But when the subject turns to a date/it does not translate." "Crown Victoria" is a tongue-in-cheek, laid-back ska tribute to trombonist Chris Malone's late model American car that, despite its regal connotation, is not a mode of luxurious transport for the band ("The Crown Victoria/You are my joy and pride/The longer the trip, the rougher the ride/Is that smoke beneath the hood?/You know that can't be good...). In life, sometimes function has to trump style, no? "Permanent Error" is a soulful, reggae-ish lament about e-mailing under the influence, and realizing that there is nothing in the world you can do to patch things up. Just move on. "Shamokin" recounts how one night on tour the band played a sold-out show in front of thousands on a bill with The English Beat; the next, they were performing for a handful of punk rock kids in this poverty-stricken, no future ghost town of a coal town near Scranton, PA (even though the mines have been closed for years, a funeral pyre-like fire still rages in one of them a mile underground). "Shamokin" is the post-WWII 1950s American dream/teenage rockstar fantasy gone bust. The American manufacturing industries that once employed millions and allowed them to provide a decent and secure middle-class way of life for their families abandonded them in favor of cheap, benefits-free Third-world labor--devastating countless communities in the US its wake (how un-patriotic can you get?). Likewise, the music business, indie or major, essentially has been rendered obsolete by the terrible advent of file sharing--how can you earn a living as a full-time musician if your fans expect to download your music for free and can't tear themselves away from their computer, smartphone, or TV screens to pay a couple of bucks see you play a gig? "Shamokin" is the heart, soul, and conscience of Bigger Thomas wrapped up in one tune: what do you do when you can't do what you love to live? For Bigger Thomas, the only possible response is to keep on making music, even if they have to "kiss their dreams goodbye": "The good old days we try to chase/they disappear without a trace/I hear the sound that we all make/its joyful noise cures my heartache." For the forgotten kids and families across the USA stuck in dead-end towns and cities like Shamokin, the answer is far less clear. Below is a video I shot of Bigger Thomas performing "I Can't Remember My Name"; the others were produced by the band. RiceRokit's Pidgin English Dropping in December! Free Four-track Download from Madness!